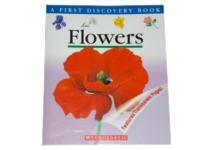 For this theme, I found a "First Discovery Book" from Scholastic entitled Flowers. This book is a crowd pleaser. It's the kind of book children love to look at over and over again. Not only is it filled with beautiful flower illustrations, as an added bonus, it features transparent pages children can turn to change the illustrations. Who can resist turning these pages to see the butterfly and bee land on a new flower, or to see flowers turn into strawberries? Not I...and certainly not my daughters! The book also shows how certain flowers are used to make foods, spices, and teas and how to press flowers. For a beautiful springtime project... go for a walk and pick flowers with your group. Children can use the book to identify them before setting them between the pages of a book to dry. The flowers they save will remind them of everything they discovered in this book!